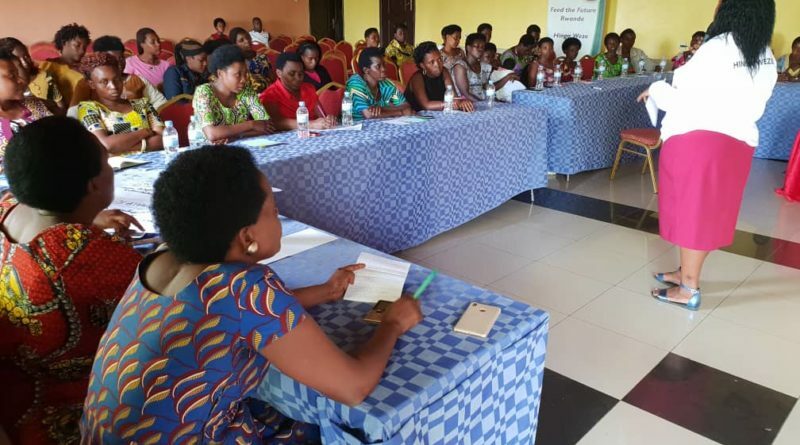 Women agro-dealers from various districts of Rwanda on September 27, 2018 gained special training on how best they can practice profitable trade of agriculture inputs that include seeds and fertilizers. 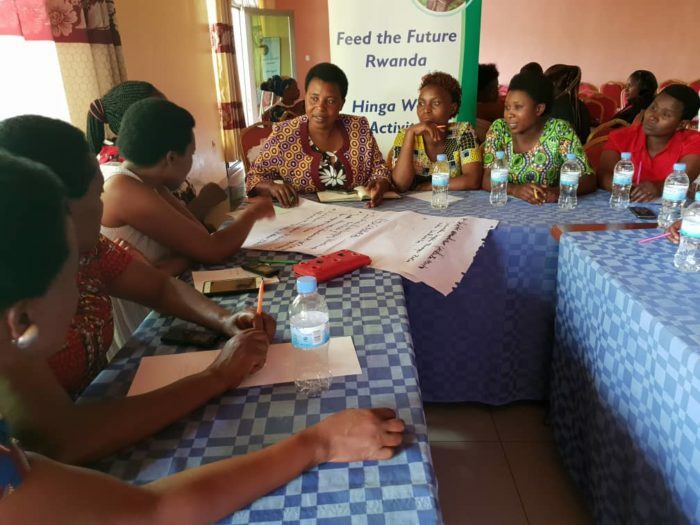 The training was organized by Hinga Weze Feed the Future project. Recent statistics of 2018 show that 38 percent of agro-dealers out of 1562 traders in the country were women. “To date, among 240 agro-dealers, 68 are women, we need to know the challenges they face, their weakness or opportunities they have so that we can help use them. 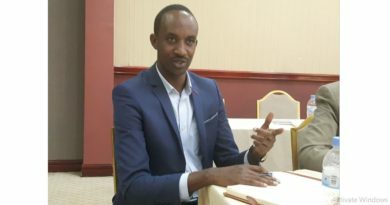 We gathered them in teams to evaluate themselves and see how to support them further,” Nyaruyonga said. 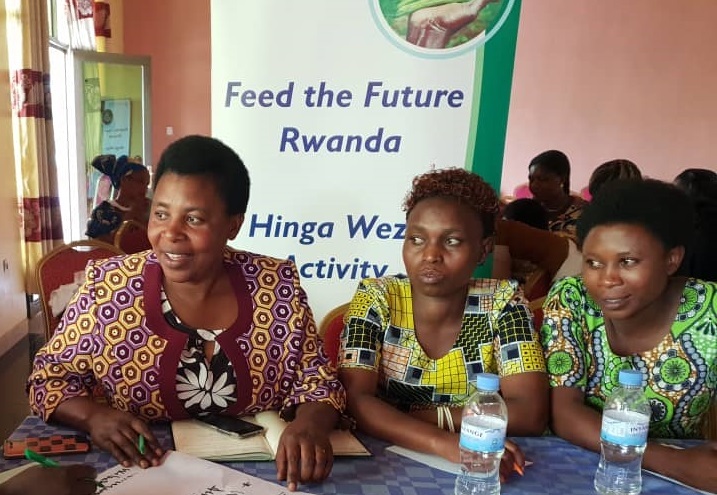 Hinga weze feed the future project operates in ten Districts of Rwanda namely: Kayonza, Gatsibo, Bugesera, Ngoma, Nyabihu, Rutsiro, Ngororero, Nyamasheke, Karongi and Nyamagabe. In order to help farmers to increase agricultural production in these long-hills districts, Nyaruyonga said that HINGA WEZE helps them building terraces to protect the soils from erosion. 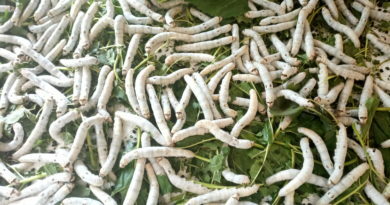 “We also teach them how to cultivate on those terraces in ways that enable them to increase the production.,” she noted. Nyaruyoga said that Hinga weze thinks on how to link these traders with Microfinance Institutions to increase their start-up capitals. 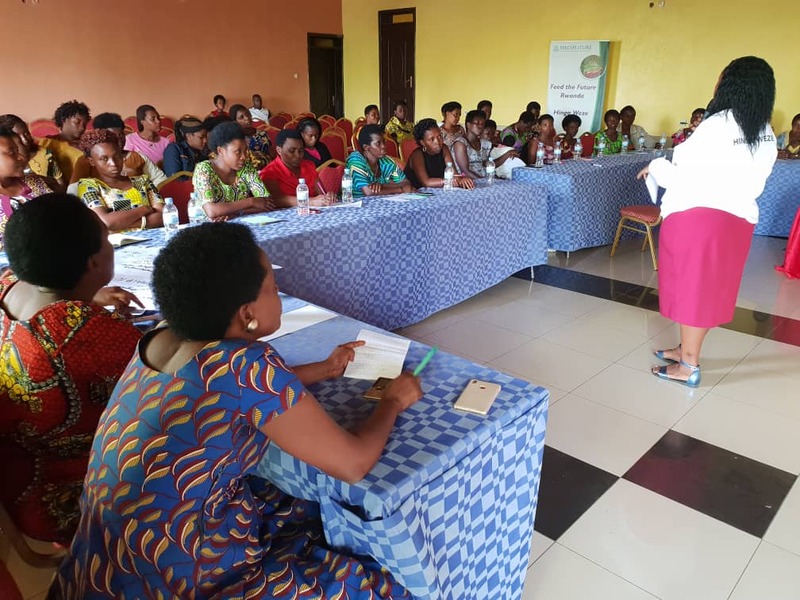 During this training, women were taught about legal framework in selling agriculture inputs and the ministerial order that governs such a trade. 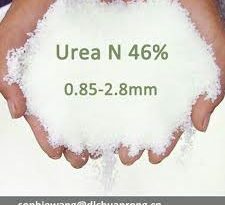 after the inspection done by Rwanda Agriculture and Livestock Inspection Service (RALIS). “We make sure that these agro-dealers have basic knowledge on agriculture inputs to be able to give further explanations to farmers who will use them in their soils,” Nyaruyonga said. Donathille Mukankomeza, one of women agro-dealers who were trained said that the training will help them cope with some challenges. “The women still face challenges of access to loans as they lack collaterals. Again interest rates on loans are still high. We also wish support in designing profitable projects. Others still face low prices during harvesting periods which encourage more investment in farming,” she said. Mukankomeza (1st L-R) explains to her colleague agro-dealers how the training can help them cope with challenges they face. 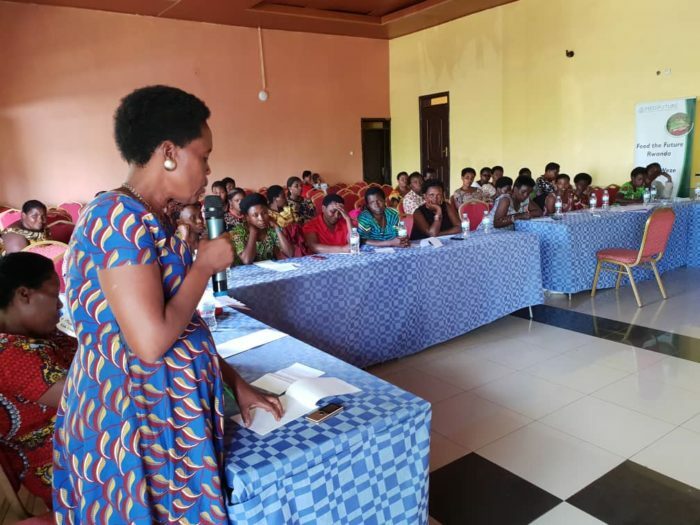 Mukankomeza has currently 8 dealing shops with fertilizers and seeds in the districts of Nyamagabe, Muhanga, Ngororero and Karongi where she employs eight workers whom he pays Rwf10 per each sold Kilogramme of what they sell to farmers adding that she also employs other casual workers in farming. “I also train small holder farmers on better agricultural practices as I work with between 3,000 and 5,000 farmers who need agro-inputs,” she said. 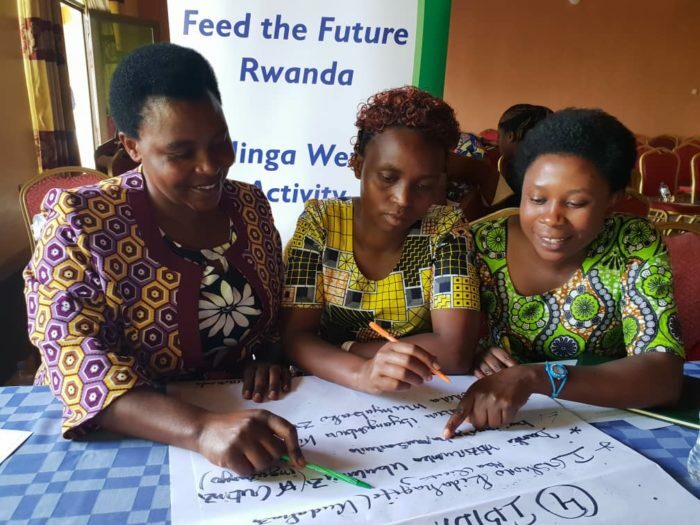 Hinga weze-Feed the Future Project trains the women on increasing agricultural productivity, how to access to markets, handling post-harvest losses, improving nutrition and how to get trading license. Currently, 70 women among 240 agro-dealers have got five-year certificates that allow them to practice legal trade of agriculture inputs.